Palma de Mallorca Airport (PMI) is accessible via the 713, 715, 717 and 719 roads, meaning that it is very conveniently positioned for onward travel to any part of the island. In light of this, many visitors choose to hire cars at the airport, in order to make travelling more convenient and comfortable during their stay. This can be arranged upon arrival or alternatively ahead of your holiday. 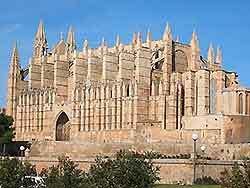 A number of additional car rental operators are available in the main resorts around the island, including Palma. Offering competitive prices, most car hire agencies at the airport and throughout Mallorca tend to only offer a basic level of insurance, which can be upgraded for a relatively small charge, ensuring peace of mind and a better cover. As with mainland Spain, you must always drive on the right in Mallorca and be sure to stick to speed limits. Reserving a car in advance of your trip to Mallorca ensures that you will get the car that is best suited to your driving requirements. We recommend this course of action in order to avoid any potential disappointment on arrival at the airport. The following car rental companies have representatives at Palma de Mallorca Airport (PMI) and their decks are situated in car parking facility P0. Book your Mallorca Car Rental here.